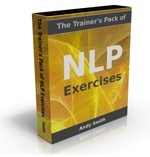 To be able to use your NLP skills wisely, you need to be aware of your own emotions. If you are not in touch with your own emotions, you will not be able to manage them or to recognise emotions accurately in others. In turn, without these competencies, you will not be good at managing relationships. Yet many people, maybe most people, aren’t that self-aware. Our education system puts a lot of emphasis on learning how to think, not so much on tuning into your emotions. Most industrially developed cultures don’t encourage you to pay attention to your emotions, especially in a business context. So it’s not surprising that tuning into your emotions and what they are telling you, and noticing the impact that your emotions have on the people around you, is a skill that many people have to work at developing. Emotions and feelings are words that are used pretty much interchangeably, because emotions show up as feelings in our bodies. But because there are so many demands on our attention, and because we spend a lot of time reviewing the past or imagining the future rather than being fully in the present moment, we sometimes don’t notice those feelings. So our emotions are still motivating us, causing us to act in certain ways, and affecting how well our physiological systems regulate themselves, without use being aware of it. Let’s do a quick focusing exercise to check exactly what physiological and mental signs of your emotions you are experiencing right now. Don’t try this while driving or operating heavy machinery! This exercise is based on the fact that emotions show up as physical feelings in your body, as well as possibly internal dialogue or mental images. For example, if I was getting angry at something, which is usually a valuable signal that someone is trying to violate my personal boundaries, sometimes the first sign I get is that I feel my fists beginning to clench slightly. Ready? OK. What’s going on inside you at this very moment? Just get comfortable and close your eyes for a few seconds so you can focus your undivided attention. Whatever physical sensations you notice, you can ask them – if you choose – what they are trying to tell you, and leave some space for the answer to come back. First of all focus on your face. Notice if you feel any tightness or tension – in your cheeks, in your jaw, or in your forehead. How do your eyes feel? Are they still and relaxed, or frowning, or are your eyelids fluttering? Notice any tension in your scalp. Now become aware of your neck. Notice how that feels. And your shoulders, and across the base of your neck. Allow your attention to move down your arms to your hands. What sensations do you feel in your forearms, in your hands, and in your fingers? And if anything you feel were to be a valuable message, what is it trying to tell you? Now move your attention down to your chest and your back. Notice how your ribs and your back muscles feel. Notice your heartbeat. And notice your breathing – is it slow and relaxed, quick and shallow, or just regular? Notice any changes and decide whether they are significant for you. And move your focus down to around the stomach area. How does that feel? And what’s that telling you? And – let your attention move down to your hips, and your legs. Notice any tension or movement anywhere along the way. And finally focus on your feet, and notice what you can feel in the soles of your feet… and in your toes. And any sensations you’ve noticed through that process, especially sensations that you weren’t aware of before, you can ask that part of the body what is it trying to tell you? 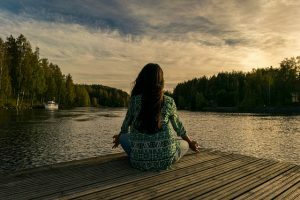 And you may have noticed that the sensations, or any tensions or involuntary movements, may have changed or quietened down as you’ve been focusing on them for a little while. Most people who do that exercise find that they feel more relaxed than before. “Attention is itself curative”, as Fritz Perls said. And if you found any sensations increased, maybe because you weren’t paying attention to them previously, it’s worth asking yourself what they are trying to tell you. Finally, notice if you are saying anything to yourself or any mental images that come to mind. And you can let those thoughts and feelings come… and go… observing them and realising that you are not just whatever thoughts and emotions you happen to be experiencing at the time… and if “you” were just the sum total of your thoughts and emotions, then who is the “you” that’s observing them? And whatever you think you are, you’re all ways more than that. So make sure you are back to normal everyday consciousness, with your eyes open, feeling relaxed and refreshed, and bringing back everything you’ve learned so that it’s there for you anytime in the future when you might need it. For your own curiosity, you may want to repeat this exercise but this time looking down and to your dominant hand – which of course is the direction associated with feelings in the eye accessing cues model (this is the ‘NLP’ part of the exercise). For most of you this will be to the right, but of course you will know from the earlier section on eye accessing cues which direction you use to access feelings. Notice what’s different from the first time you did it.